Biography: The church that Mark and Sally now pastor was a Methodist chapel that Mark's parents were asked to leave in the 1950's when they were filled with the Holy Spirit. Then in 1968, when the Methodists were going to close the church, they asked Mark's parents to take it over and continue the work of the Lord. 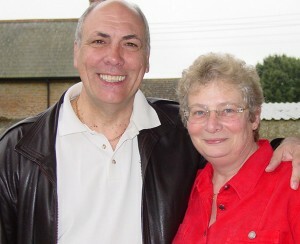 Mark became pastor of Bible Christian Centre in 1986. Signs and wonders follow the preaching of the Word, and the church continues to grow. Their mission statement is: "To change the world's perception of the Church." Mark and Sally direct Equippers Bible School, having previously directed Charis Bible College for Andrew Wommack in Chard. Strengths: Mark is a gifted teacher of the Word of God and obviously loves equipping the saints for the work of the ministry. Sally spends much of her time encouraging members of the Body of Christ to reach their potential in Christ. Andrew and wife Paula, live locally and work in the church. Timothy and wife Lucy, live in Lancashire. Mark and Sally are also proud grandparents.